When I reported on Outcast last year, I was more than a little underwhelmed, but the damn thing hasn't even premiered yet, and they've already purchased a second season. Is Cinemax just light on their scripted series offering, or is it really worth the time? The story (from my original post, and not on the new press release): Based on Skybound/Image comic title by creator Robert Kirkman and artist Paul Azaceta, follows Kyle Barnes, a young man who has been plagued by demonic possession all his life. Now, with the help of Reverend Anderson, a country preacher with personal demons of his own, Kyle embarks on a journey to find answers to obtain a normal life he has never known. But what Kyle discovers could change his fate — and the fate of the world — forever. The new poster is a far cry from the original - and instead of Patrick Fugit looking more like a knockoff of Donnie Darko than anything, he appears in more of a heroic stance facing his demons head on instead of moping in the dark about it. Demonic possession is a popular card to play in 2016, and that's something I never thought I would say. 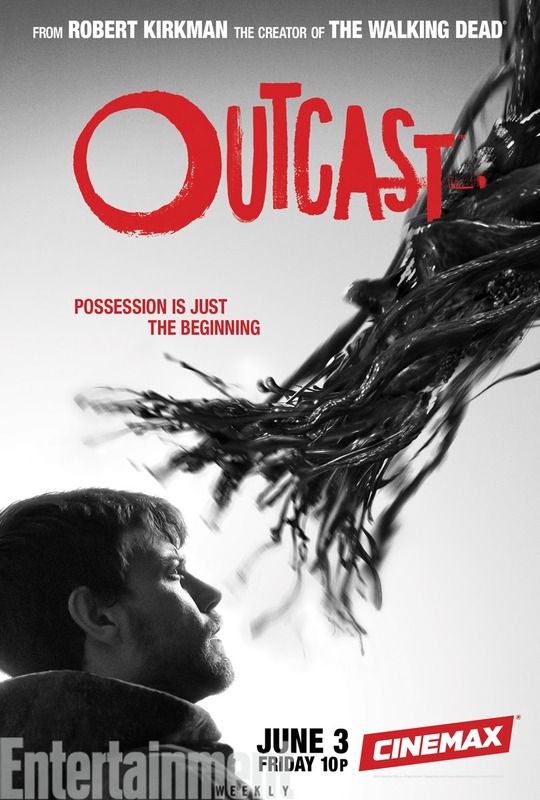 Thankfully, Outcast is a serious look at this completely overplayed (but much loved) sub-genre and with Kirkman at the helm, the odds are good that the series will be beautiful to look at when it comes to the gore, as well as the human emotion. Outcast premieres on Cinemax on June 3rd. Oh but wait... here's the entire first episode! What say you about this demonic encounter?